Successfully Added Wismec Reuleaux RX2/3 Box Mod - 510 Thread, Upgradeable Firmware, 200W, LED Display, 3x 18650 Cell Battery, Temp Control (Black) to your Shopping Cart. Enjoy the next level vape experience with the Wismec Reuleaux RX2/3 box mod. This powerful box mod features a replaceable back cover thanks to which it allows you to insert either two or three high-rate 18650 cell batteries that are able to reach up to 200 Watt – making this electronic cigarette the perfect vaporizer for all the advanced vapers out there. 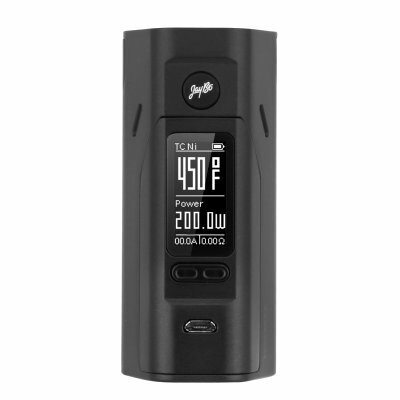 Although this 200W vape box mod holds some real power, it still manages to keep a compact and lightweight design that lays comfortable in the hand. Its durable Zinc alloy design furthermore makes the Wismec Reuleaux RX2/3 extremely durable, allowing you to carry it along in your bag without needing to fear about damaging your beloved electronic cigarette. Whether you’re at home, in the car, or enjoying a relaxing evening walk – with this powerful 200W box mod at your side you’ll always be able to enjoy a tasteful vape no matter where you are. With its intelligent design, the Wismec Reuleaux RX2/3 allows you to manually control the amount of Wattage produced up to 200W and additionally lets you select the temperature – assuring that you’ll be able to enjoy a vaping experience that is truly customized to meet your personal vape needs and desires. To make sure that you’ll always have the right settings enabled, this 200W electronic cigarette features a sophisticated LED display that has been smoothly intergraded within its stylish design – providing you with constant and up to date information on the currently selected temperature, Wattage range, ohm resistance, battery life, and a whole lot more. An additional little feature that comes along with the Wismec Reuleaux RX2/3 is its upgradeable firmware that inter alia supports the input of customized logos. Simply connect this 200W box mod to your PC via its micro USB port and you’ll be able to download and add custom logo’s that will be displayed on the Wismec Reuleaux RX2/3’s LED display – providing you with a cool feature to customize and personalize your vaporizer. Thanks to its 510 thread, this electronic cigarette is compatible with the vast majority of tanks and atomizers that are available on the market. Simply attach your old and beloved RTA to the Wismec Reuleaux RX2/3 and you’ll be able to vape the day away with your custom built 200W electronic cigarette. Once attached to your tank atomizer you’ll be able to simply insert your favorite taste of e-liquid and you’re all set to enjoy the perfect personalized vape experience. With this powerful vape mod at your disposal, you’ll be able to sit back, relax, and enjoy great flavor and a powerful experience during all your upcoming vaping sessions.